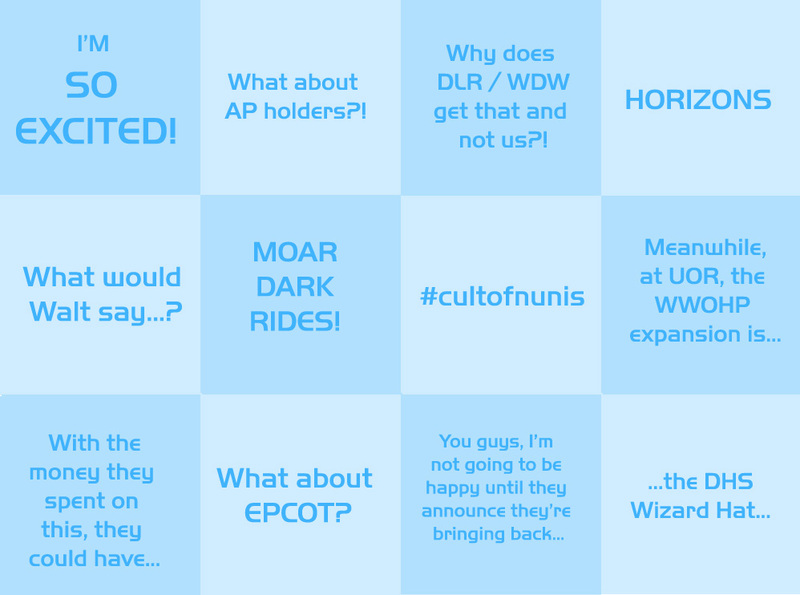 Disney Parks Announcement Bingo: Play Along at Home! I joke sometimes that because I deal with online communities all day in my professional life, I don’t have the energy to get involved with them in my personal life. This is nonsense, of course (just look at how much I tweet), but I can have a mild aversion to forum-style interaction, because over time it becomes a bit of an echo chamber, without the ease of unfollowing. So, I’m not a member of many Disney communities, and I choose my interaction carefully. After all, so much of it is not for me. It’s for people who have this amazing Disney centred life in Florida or California or at least some part of the US. Which means, perhaps, that I get to focus a different lens on the whole thing. And it’s kind of amazing and funny and brilliant to me that I now know the lay of the land well enough to roll my eyes – fondly, affectionately – every time there’s a new Disney Parks announcement. Because you are guaranteed – guaranteed – to hear at least four of the below with every one of those. From the gushing excitement that verges on stalking (guilty of that) to the harking back to a golden era (that too) and the pining for a certain long lost attraction that just won’t die (yep), you know you’re going to hear it all. Again. Sometimes I think it’s the comforting predictability of it that brings me back for more. If we’re all a bit nuts, let’s be nuts together, publicly – strength in crackers numbers.